Saturday's conference of the Trade Unionist and Socialist Coalition (TUSC) will feature a keynote debate on the controversial issue of whether or not socialist anti-austerity candidates should stand in this year's local council elections. The session under the heading, 'Building support for Jeremy Corbyn's anti-cuts policies in the 2018 local elections', will discuss two resolutions that have been submitted to the conference calling on TUSC to put up candidates - but not "against consistent public supporters of Jeremy Corbyn and his anti-austerity policies" (see http://www.tusc.org.uk/txt/411.pdf). The conference will be chaired by Jeremy Corbyn's old parliamentary backbench colleague, Dave Nellist, the former Labour MP (1983-1992), who is now the chairperson of TUSC. All TUSC supporters are welcome and there will be plenty of opportunity to join the debate. The conference also includes a forum session on 'TUSC and the Brexit negotiations'. As the process towards EU exit reaches a critical conjuncture, the session will discuss where trade unionists and socialists should stand on the various issues raised in the Brexit talks. 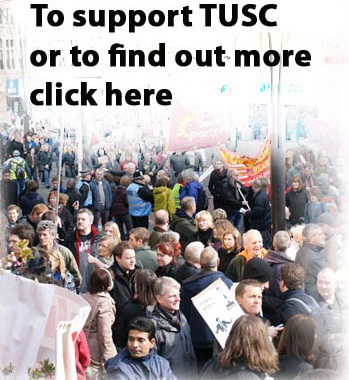 To help prepare for this session, and the continuing debates to come, the TUSC steering committee has produced a Discussion E-Bulletin, available at http://www.tusc.org.uk/txt/410.pdf. The conference is on Saturday 10th February from 11am to 4-30pm (registration from 10am) at Student Central, Malet Street, London WC1E 7HY. There is a conference registration fee of £10 waged and £2 unwaged/low-waged. There is no need to register in advance but please come early if you have not done so. There will be capped pooled fare of £15 to not discourage attendance from outside London. This means that if your transport costs are more than £15 you can get the difference back (although please do what you can to keep costs down as any capped fare shortfall will come from TUSC campaign funds). If your travel costs are less than £15 you will be asked to pay in the difference to the pooled fare.